Photo montage of the proposed monument at San Pedro de Cardeña. At his Jaily News blog, Nacho García reports on the attempt to remove the monument to the International Brigades in Madrid, the monument to the Lincoln Brigades in New Hampshire which is now threatened with being auctioned, and the status of the monument to the Brigades in Burgos. 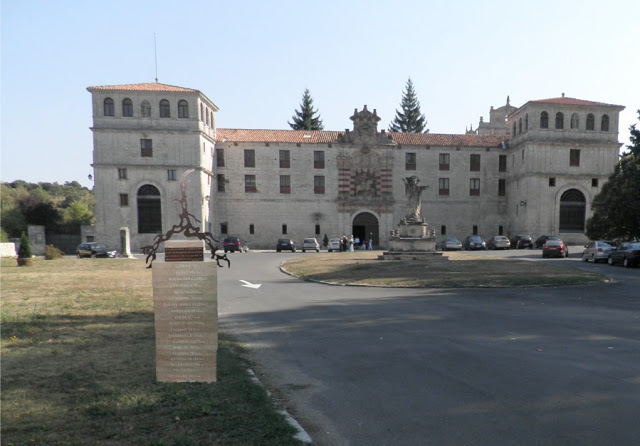 The Jaily News is inspired by and named after the underground newspaper published by the Abraham Lincoln Brigade prisoners in San Pedro de Cardeña, Burgos. Nacho García began publishing the Jaily News in order to expose the fascist brutality that existed in Burgos, and to hold up the courageous example of the anti fascist prisoners as an inspiration to the current struggles in Spain. The antifascist committee in Burgos first attempted to mount a plaque to the Brigades outside the monastery in San Pedro where the IB’s were kept prisoner in 1998. In spite of a well attended ceremony of approximately 350 people at the dedication, the plaque was removed in a number of days by the right wing government in Burgos. Nacho and I both noted the similarities to the removal of the New Hampshire plaque, which was also removed immediately after its’ installation. The New Hampshire plaque may face the possibility of being auctioned off, although efforts are being made to secure a place for it at the university, attended by many of the IB Volunteers from New Hampshire. Another attempt was made install a monument to the IBs at San Pedro in 2011, at the same time the monument to the IB was dedicated in University City, Madrid. The Burgos Tribute Committee to the Brigades faced similar tactics to those employed by the authorities in Madrid, as the local Burgos government and religious authorities ignored and delayed their repeated requests for a permit. The Arts and Cultural Center in Madrid, which hosted the exhibition on the International Brigades at San Pedro, has lost its 2013 funding and is now in grave danger as well. In Madrid, Burgos, and right here in the United States, we all face the same task of reclaiming and preserving our historical memory!